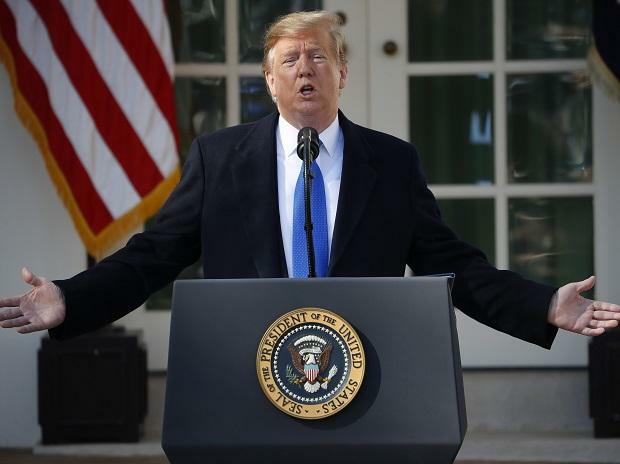 Donald Trump ended two months of uncertainty on Friday by signing a spending bill to keep the federal government open, but the political fight is just beginning over his decision to declare a national emergency on the border. House Democrats may pass a resolution disapproving the emergency declaration, which the White House says allows him to take $3.6 billion from military construction projects to instead build a wall on the U.S. border with Mexico. Senate Democratic Leader Chuck Schumer could force a vote on the resolution after it passes the House, and there are indications that several Republicans would support it. That would put Trump on the defensive, requiring him to at least lobby his own party to defeat the resolution while publicly defending an assertion of presidential authority that two-thirds of Americans oppose, according to a CNN poll released Friday. In the political worst case for the president, he’d have to veto the resolution. But it still would prove embarrassing to Trump if large numbers of Republicans go on the record saying they disagree with his approach to building the wall and provide Democrats with ammunition to accuse him of executive overreach. Trump on Friday downplayed concerns he could lose a Senate vote, telling reporters “not too many people” had said he acted inappropriately. While opposition to Trump’s emergency declaration is most pronounced on the left, there is plenty of concern in Trump’s own party. Republicans frequently criticized President Barack Obama for using his executive authority in ways they considered unconstitutional, and some of them are now worried Trump could set a dangerous precedent for future presidents. They may be forced to choose between backing their president and standing on principle. Regardless, much of the drama will play out in courts, where Democrats are likely to challenge to the constitutionality of president’s move. House Judiciary Committee Chairman Jerrold Nadler, a New York Democrat, said Thursday he would pursue a resolution to terminate the emergency declaration. “The only emergency facing the American people right now is the president’s intent to subvert the separation of powers and the rule of law,” Nadler said in a statement. House Speaker Nancy Pelosi was more circumspect Thursday, saying she hadn’t made a final decision on whether to pursue the disapproval resolution or possible legal action. But if Pelosi does decide to bring the resolution to the House floor, the Democratic majority should easily pass it. That will focus attention on the Senate, where the resolution would be privileged -- a procedural designation that allows it to leapfrog other business and prevents Senate Majority Leader Mitch McConnell from blocking a vote if a Democrat requests one. Several Senate Republicans have already said they oppose the president’s move, led by Senator Rand Paul of Kentucky, who told reporters late Thursday that the “checks and balances of government” would be dashed by the precedent. Senator Susan Collins of Maine, a top target for Democrats in the 2020 elections, said she was also opposed to the declaration. Other Republicans facing re-election in competitive states, including Cory Gardner of Colorado and Martha McSally of Arizona, may feel pressure to vote to disapprove Trump’s declaration but risk angering the GOP base in their states. Marco Rubio of Florida and Lisa Murkowski of Alaska have also expressed concerns. If the White House is unable to prevent enough Republicans from defecting, the coming weeks could see Trump forced to use his first-ever presidential veto to block legislation essentially accusing him of constitutional overreach. That would provide a new cudgel to political opponents who have already painted the president as lawless and uncompromising. Assuming all Senate Democrats voted against the emergency declaration, just four Republican votes would be needed for the disapproval resolution to be sent to Trump’s desk. But some GOP senators who expressed concern with Trump’s move wouldn’t commit to vote for a disapproval resolution. Senator Mike Lee of Utah said in a statement that Congress “should use this moment as an opportunity” to regain power from the executive branch, but also said Trump’s actions were legal and did not endorse any particular course of action. And while Republicans facing re-election might see political value in bucking Trump, doing so risks drawing a primary challenger from within the party. Collins, in particular, has earned a reputation for voting for Trump’s priorities despite public hand-wringing -- including, most memorably, her vote to confirm Supreme Court Justice Brett Kavanaugh. Ultimately, a disapproval resolution might not stop Trump from using the Pentagon money for a border wall. Even if the resolution clears both chambers, at least 20 Republican senators would have to vote to override the president’s veto. Most Republicans are not going to want to take on Trump, and would rather get back to their legislative agenda after months of fighting over the budget and a 35-day shutdown, said Ron Bonjean, a top aide to former Senate Majority Leader Trent Lott. But even the president himself seemed resigned to an extended battle over his attempt to end-run Congress, whether in the political or legal arena. “We will have a national emergency, and we will then be sued, and they will sue us in the 9th Circuit, even though it shouldn’t be there, and we will possibly get a bad ruling, and then we’ll get another bad ruling, and then we’ll end up in the Supreme Court, and hopefully we’ll get a fair shake," Trump said at his Rose Garden news conference.